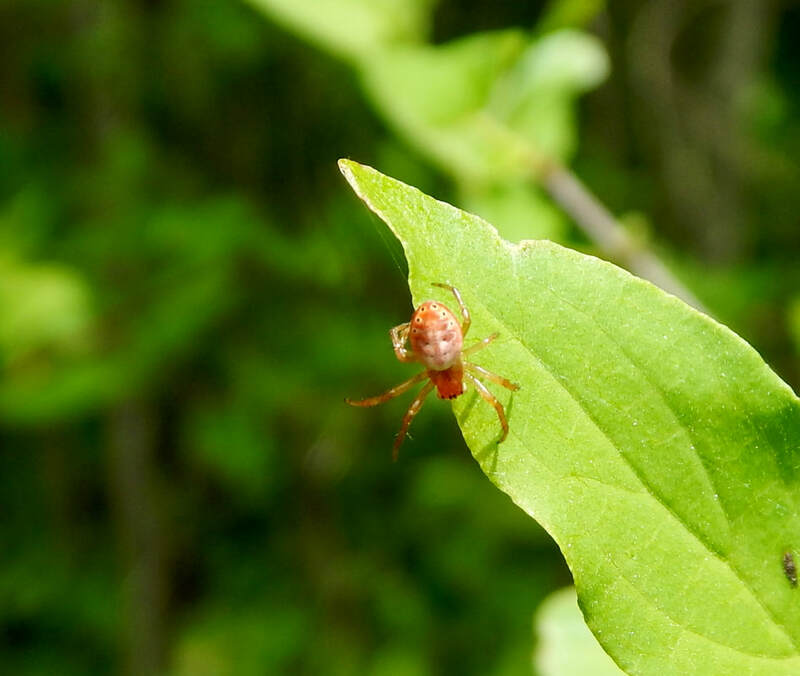 Description: Small orb weaving spider with a round yellow, white or reddish abdomen, juveniles tend to be more reddish. The lower sides of the abdomen are reddish brown and the underside is yellowish. 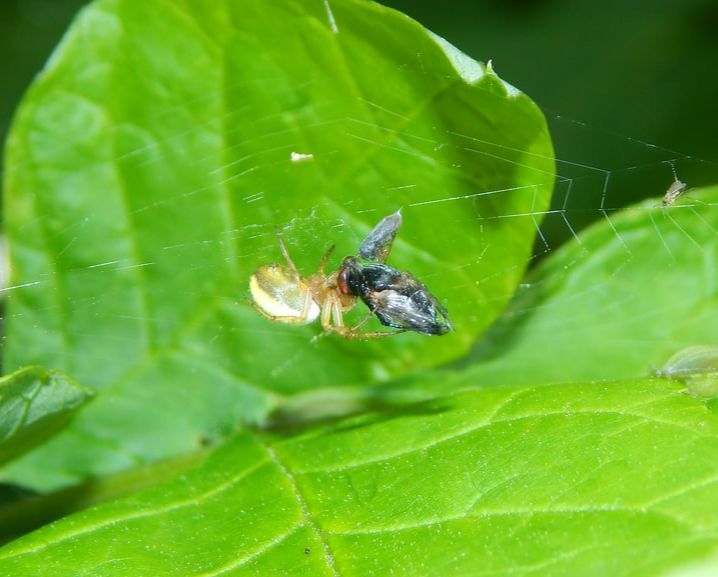 These spiders have six very distinguishing, dark spots with a lighter colored border on the edges of the posterior end of the abdomen. Females are larger and more obvious than males. Web: A tiny orb web spun in a shrub or tree. It usually is made in a leaf, gently curling the leaf or leaves into a trap. Sometimes made between branches or stems. 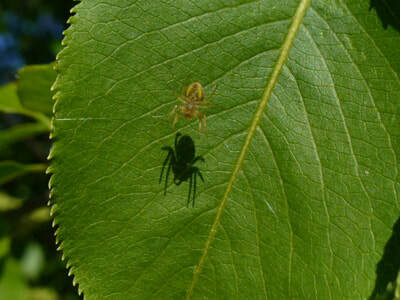 Although they are not particularly large spiders, they can seem large for the web they spin. 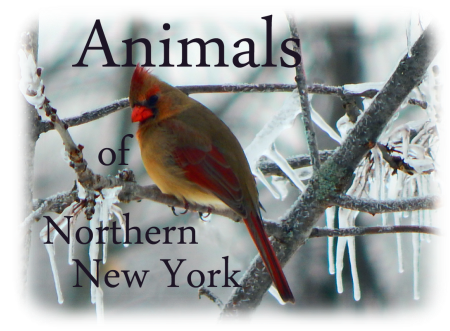 Habitat: Forest edges, woodlands, and field edges. Look on trees and shrubs, especially large leaf plants such as bass wood, oak and maple where they use these large leaves to make their web. Adults are active in May and June, laying their eggs and becoming scarce. Young spiders start to become noticeable soon after the adults disappear making smaller webs in similar locations as adults do. 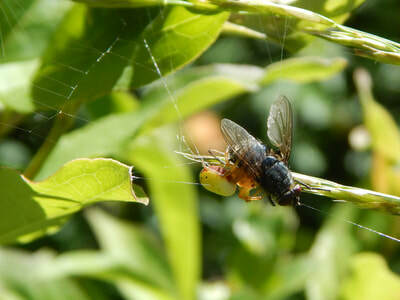 Diet: Small insects such as beetles, plant bugs and especially flies. They sit in the center of the web, or occasionally off to the side, and wait for prey to hit the web and become entangled. They quickly bite and wrap the prey lightly in silk. Eggs: Eggs are laid in June or early July when females are at their max size. 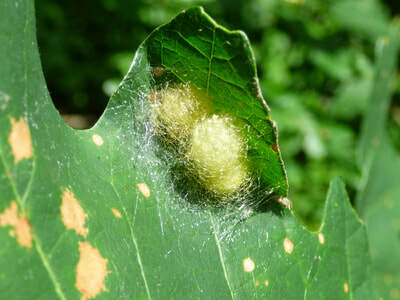 The eggs are held in a silken sac that is rough looking and yellow in color; these sacs are deposited in a folded leaf near the web of the mother. She often lays multiple egg sacs.